Hey y’all! Amita here with today’s #BigSell30! Join us and experience one new piece of pop culture every day for 30 days! 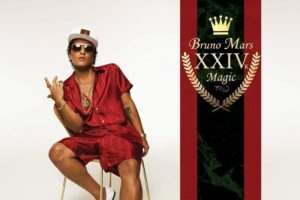 I had a whole other idea for what I was going to sell today but I scrapped it as soon as the new Bruno Mars single “24K Magic” filled my ears on Friday! This funk/dance/pop/soul instant hit is giving me the throwback feels!! This single feels like the love child of his 2013 hit “Treasure” and 2015 smash single “Uptown Funk” with Mark Ronson. And if you were living under a rock and haven’t heard one of these- let me break it down for you- 1 fun party dance song + 1 even more fun party dance song= new get on the dance floor single! I woke up to this fun party song as it was playing on the radio when my alarm went off and then had the pleasure of hearing it again in my Spotify Release Radar playlist and I was hooked. I’m a huge fan of Bruno Mars’ first two albums and think he is an incredible musician and songwriter, but his live performances are what really impressed me- remember when he and Beyoncé had a dance off at the Super Bowl earlier this year?! Or when he brought down the house during the 2014 Super Bowl halftime show? He is definitely on my list of people to see in concert and when his album drops on November 18th, you can guarantee it will be on repeat in my house and I’ll be on the watch to see when he starts a new tour! When Bruno announced the single release on Instagram he said “You can call it my first single, but I call it the invitation to the party.” Thanks for the invitation Mr. Mars. Consider this my RSVP. You can listen to single and watch the Vegas party themed video here. How do you even make a video to this song without just having a party for hours?! As always, let us know if you have a Big Sell for us for #BigSell30 on Twitter and Instagram @PopInsiders and leave a comment below to let us know what you think of our Big Sells so far!